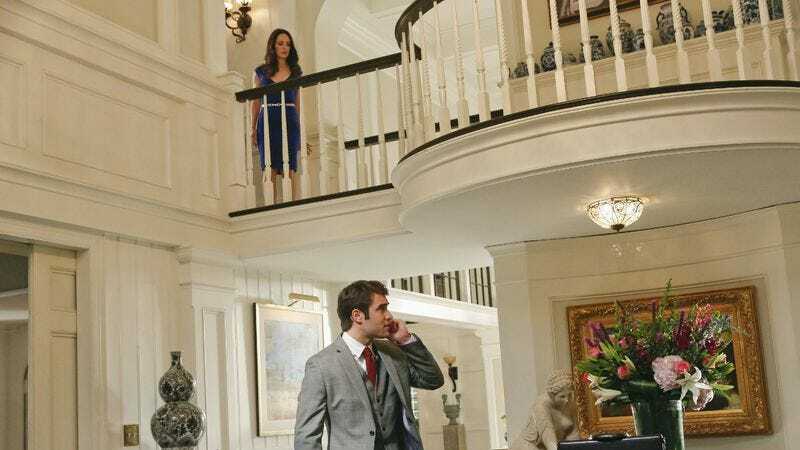 One of the biggest issues with Revenge season two has been the distinct lack of forward momentum. When the show committed to the big Initiative conspiracy plot at the end of last season it was a gamble, and it hasn’t paid off yet for one main reason: The show got so lost in its quest for long-form conspiracy that it forgot what made it so very satisfying in the first place: the immediate gratification of Emily’s continued vengeance. “Union” doesn’t completely fix these problems, but for the first time in quite a while it feels like the tide is on the verge of turning. The main reason for this turn is the very welcome development of something finally actually happening with the Initiative storyline. In spite of being around since the beginning of the season, everything about the Initiative has been firmly background business; shadows and vague threats that never seemed to be quite interesting enough to make them an effective villain. Even at the beginning of tonight’s episode, when Daniel was blindly accepting business advice from Helen Crowley, it remained frustratingly cryptic. Why did Daniel continue to follow Helen’s advice even when it went against everything he wanted to do? To him, she is just a shareholder in the company. She’s not his boss. But quickly my fears were allayed when Victoria—finally, Victoria!—decided enough was enough and she had to dig Daniel out of his ever-deepening grave with the Initiative. Victoria’s plan to extricate Daniel from their grasp? Tell him the truth! Revenge is a show that lives on lies and half-truths, so Victoria’s decision to finally just fess up to Helen’s true identity was a breath of fresh air. Unfortunately for both her and Daniel they are not aware of the stealth video camera in Daniel’s office, and Helen overhears Victoria’s confession and her plans to take the Initiative down. The capper to it all is the best thing about the episode, and the best thing the show has done in quite a while: Victoria shooting and killing Helen after she threatens Daniel’s life. Victoria is a duplicitous mess, a woman who would do anything to weasel her way out of a sticky situation, but the one thing she has steadfastly remained is fiercely protective of the lives of her children. (Sure, she’d manipulate them and lie to them and hurt them, but someone else doing these things? Brings the Mama Bear right out.) But Victoria, Conrad, and Daniel all standing over the corpse of Helen Crowley is a delicious development, one that will force them to work together to solve the problem and maybe even draw the Initiative (and their shadowy goals) out of the woodwork. Madeline Stowe was icy perfection in the whole scene as well, in a way she has rarely gotten to play lately. A satisfying development all around. Also very satisfying—and this one has been a long time coming—was Jack, Amanda, and the bar that ate the Hamptons. The second Conrad got involved in their affairs I had high hopes the plot would redeem itself and this week it definitely did. Sadly, the main reason for this is Amanda finally decided to do what everyone has been begging her to do for months: Go to Emily, explain their horrible situation with the bar and Conrad, and get her to pony up the money to save their hides. When Conrad refuses to take their deal so he can continue to develop the waterfront casino with the stupid brothers of doom, Amanda steals some of Emily’s intel on the Graysons and uses it to blackmail Conrad into accepting the deal. It’s a terrifically fun scene, the kind Revenge used to do almost once an episode, and it’s great to see Amanda finally let off her leash and allowed to show some of her juvenile-detention roots again. The brothers of doom are not happy about Conrad’s new deal, however, and the episode ends with Jack and Amanda happily sailing away on their honeymoon while brother Nate cuts the boat’s radio below deck, promising an imminent resolution to that boat wreckage scene from the first episode of the season. It sure did take a long time to get to this place, but at least it finally seems like kind of an interesting place to get to. Hanging behind the action more tonight was Emily, who spent most of her time helping Aidan deal with the loss of his sister and mourning the life she’ll never have with Jack. Emily Thorne is a deeply tragic character, which is easy to forget when she’s out there manipulating people and generally tearing things down. But she herself is completely torn down; a shell of a person merely surviving on the fire that avenging her father’s death brings. Her relationship with Aidan hasn’t been the boon the show was obviously hoping for, but they have an interesting kindred spirit about them, nicely defined here by Emily’s speech explaining how it’s not that she never hurts or shows emotion, it’s that she always hurts and her quest is the only thing that gets her through. Yes, this basically means Emily is the Hulk of Hamptons revenge plots, but doesn’t that seem oddly appropriate considering everything she’s been through? Finally, there’s poor Nolan and his deadly relationship with Padma. With the bar story finally taking off, this is the clear candidate for the worst plot on the show, which is unfortunate considering “Nolan” and “worst” should simply never be in the same vicinity. The one saving grace about this whole thing is that Nolan finally confronts Padma and she confesses everything, including the fact that she is only doing it because the Initiative is holding her father hostage until they get what they want. The story wouldn’t be so terrible if poor Nolan wasn’t forced to utter lines about his feelings for Padma, which roll off his tongue with barely enough conviction to sell himself, let alone the audience. Listen, Gabriel Mann is great as Nolan, and Nolan is a breakout character, but nothing about this story or his relationship with Padma is interesting or even believable. Here’s hoping either Padma or Nolan is pulling a big double-double-cross to save this whole thing. But next week! Next week promises the boat crash we’ve been waiting for. Thoughts on who’s dead? My (very uneducated) guess is Amanda, because Jack is never allowed to have good things. Emily’s flashbacks with Jack were a bit too saccharine but worth it for the moment she gives Amanda the ring from their pretend wedding as children. Emily’s acceptance of Jack and Amanda's relationship is probably the most heartbreaking thing about her. Nolan, your wedding suit is fabulous.